Bumblebees can develop an addiction to nicotine-containing pesticides, British scientist find. Dan and Neil teach you the language the media is using to discuss this story. 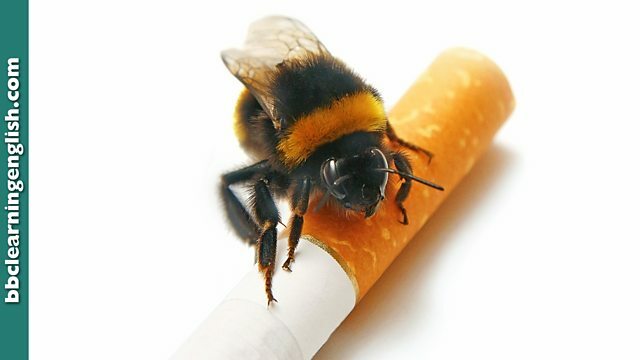 British scientists have found that bumblebees prefer food coated in a nicotine-containing pesticide and develop an addiction similar to a human smoker. Scientists in Britain have found that, given a choice, bumblebees prefer food containing a pesticide which is harmful to them. The research provides further evidence that bees develop addictive behaviour when exposed to neonicotinoids, similar to humans who smoke. The pesticides have been linked to declining bee populations. • Have you seen the new reality TV show? I'm totally hooked on it. It's great! • Once I scored my first goal, I was hooked. Nothing beats football! • He only seems to get a buzz out of video games. He says everything else is boring. • Running marathons gives her a real buzz. She loves the challenge. • Have you tried my new cocktail? It's an acquired taste! No one likes it immediately. • I didn't like boxing at first, but now I've acquired a taste for it. It's my new hobby. Which preposition do we use with 'hooked'? Complete this sentence: She's currently hooked ______ a band called Space Hamster. How do we use 'get' and 'give' with 'buzz'? Are they the same? 'Acquired' is a difficult word to spell! Which of these is spelled correctly?